Jessica Strawser works literary magic from two distinct angles. As an author, her debut novel, Almost Missed You, was recently named to the shortlist of Best New Fiction by Barnes and Noble and is a PopSugar "Best Spring Reads" selection. It's a nuanced work of fiction that centers on the themes of parenting and fate. Strawser is also editor-at-large at Writer's Digest magazine, which has been a resource for aspiring and established writers for nearly 100 years. She lives in Cincinnati, Ohio, and raises her two young children with help from her supportive husband. Holly Rizzuto Palker spoke with Strawser about her career at Writer's Digest, her advice for other writers, and her thoughts on finding balance. Holly Rizzuto Palker: What is a typical day like for you as author, mom, and editor-at-large of Writer's Digest? Jessica Strawser: Well, I'm still trying to figure that out! Up until this month, I'd take my daughter to preschool, put my son on the bus, and be in the office around 8 a.m. A day would vary from proofing pages for a printer deadline, to working with contributors on new features, to assisting with programming for our events. Though I rarely took a lunch break, I was always home for a family dinner, and the evening belonged to my kids and husband. After bedtime stories and snuggles, I’d retreat to my home office to work on my fiction (and/or promote my debut novel and forthcoming follow-up release) until I’d have a hard time staying awake in my chair. I'm transitioning to a more independent day where my own writing and promotional efforts come first—there are many types of writing I'd love to do to complement my novels—and then a chunk of the afternoon is spent plugged into Writer’s Digest. I'd love to reclaim at least a few evenings a week away from the laptop! After years of such an intense routine, my husband and I both miss occasionally having a chance to reconnect at the end of a weekday. HRP: You started as an intern at Writer's Digest and eventually moved into the position of editorial director and, now, editor-at-large. What did your professional path look like? JS: I did start my career with Writer's Digest as intern for the books line, then editorial assistant for the magazine, then associate editor who had a heavy hand in our special issues and our now-defunct sister publication, Personal Journaling magazine. I moved on to spend several years in book editing at a variety of niche nonfiction imprints, worked a brief stint in marketing and public relations, and spent some time freelancing before returning to WD as chief editor in 2008. To have hands-on experience in so many areas of publishing has been an asset in curating content for our audience of aspiring and working writers. Only very recently, with my own writing projects demanding more of my attention, did I scale back my role to an editor-at-large capacity in order to allow more time to honor those commitments. But I'm still involved in editing, advising, and writing for the magazine and website, as well as representing the brand at events online and off. HRP: How is Writer's Digest different than other writing magazines, and what are the best ways for new and emerging writers to use Writer's Digest as a resource to help their careers? JS: Every issue contains techniques for honing aspects of your craft, a hefty dose of inspiration and motivation (from debut authors, independent journalists, midlist successes and best sellers alike), and the insider perspectives you need to knowledgeably pursue various paths to publication: agent profiles, highlighted markets, trend pieces, marketing tips, and the like. Every issue has a themed, feature package, enabling us to comprehensively cover topics such as, finding an agent, self-publishing, and examining many facets of novel writing or freelance success. Our stable of columns and departments still offers something for everyone. We take an intimate, writer-to-writer tone—smart and savvy without being especially academic. HRP: Which is your favorite section of Writer's Digest magazine? JS: Our in-depth "WD Interviews" with bestselling authors that serve as cover stories for every issue are my favorites. I often pen them myself (although I love them even when I don't), and, in the course of doing so, have delved into the craft and lifestyle of writing with many amazing talents: Alice Walker, David Sedaris, Lisa Gardner, Patricia Cornwell, Harlan Coben, Khaled Hosseini, Elizabeth Berg, Jojo Moyes, David Baldacci, Liane Moriarty—I could go on and on (and often do). I'm working on one now for our February 2018 issue and already, I can't wait for you to read it! HRP: Writer's Digest also holds an annual conference. What's that like? Where is it held? JS: It's earned its place as an industry leader for a reason: it just keeps getting bigger and better every year. This year’s event drew nearly 1,100 writers and industry pros to the Midtown Manhattan Hilton, where we'll be returning in August. There's so much information, so much support, and so much talent to be found there. Emerging writers connect with agents in our pitch slam; panels and instructional sessions light up packed rooms with ideas; writers form lasting friendships; and groups between sessions and keynote addresses fill the positive energy to brimming. Writer's Digest also hosts a novel writing conference held in Southern California in the fall. HRP: How did Writer's Digest inspire you to be a better writer? JS: Every time I start to feel myself floundering, I don't need to look far for reminders that this whole mysterious writing endeavor can be done and that, when done well, it can make for the most wonderful, satisfying sort of creative life. There's really no way in which WD has not inspired me to be better, to reach higher, and to feel less alone at the keyboard. HRP: How do you balance your many roles—editor, author, mother? JS: Funny enough, I have actually spent quite a bit of time atop a balance board in physical therapy (thanks to chronically bad knees from years of ballet), which has a way of making one think of balance literally. I think we working parents often talk about the concept as if we can find the perfect mix and then relax and stay there comfortably. But the truth is that when you're physically balancing, all of your muscles are engaged and you're constantly swaying your weight one way or the other so as not to fall. With that in mind, I try not to beat myself up over trying to do everything in equal measures all of the time. Some days you lean in toward your family while other days the writing pulls extra weight. And there are deadline weeks when I know my magazine work won't leave me much good energy for anything else. It's a constant shifting, and I've never held myself up as an example of doing it well—but I do try very, very hard, which I think is the best that any of us can do. HRP: What piece of advice would you give other mother writers about finding time to achieve their personal and professional writing goals? JS: I had the privilege of interviewing Debbie Macomber a few months before my first novel published, and she's an absolute force in the romance world—200 million books and counting—who started with only a high school degree, a rented typewriter, and a houseful of little ones. At one point, she'd been pressured to quit writing because her rental typewriter was an expense her family could scarcely afford, and she wrestled with guilt over not only her time but her money, but still she pressed on. Her children are grown now, but when she learned that mine are young (three and six), she took time to stop the interview and tell me that she sees writing with young children as a blessing. She said that not only did it teach her to write through distractions and to be less precious about her routine, but that she has seen evidence through her children's entire lives that she truly showed them the power of working toward a dream—and what a gift that was. I was feeling particularly overwhelmed at the time, and I really can't tell you what it meant to me to hear that from someone in her position. To have her look back and say: this is worthwhile in ways you don't even yet realize, and you should not second-guess your own pursuit of something that is going to show your children determination and strength and creatively fulfill something inside you at the same time. For me, it still means taking as little time away from my kids as I possibly can, but I think that kind of perspective can really help us all focus on the bigger picture on the harder days. HRP: Your degree is in journalism. How did you use your nonfiction background to write fiction? JS: Regardless of what genre I'm writing at any given time—I've also published personal essays in venues such as The New York Times' Modern Love column and Publishers Weekly—I'm keenly aware that I'm imparting information to the reader. That was especially useful in writing my debut novel, Almost Missed You, which juggles three POV characters, jumps around in time, and has a series of carefully crafted reveals that made it essential to keep track of what the reader knows at any given point in the story. 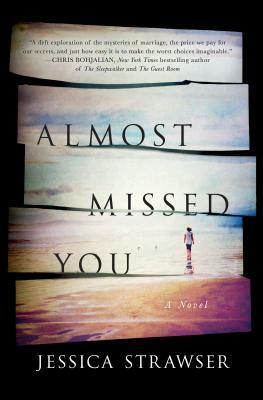 HRP: Almost Missed You tells the story of Violet and Finn, a couple everyone says was "meant to be." So, no one is more shocked than Violet when Finn packs up their hotel room on a beach vacation and disappears with their three-year-old son. The story is told from the point of view of these two characters as well as that of Finn's best friend, Caitlin. What methods did you use to create such distinct voices? JS: I was playing with the idea that we're all unreliable narrators of our own stories, just by the very limitations of our perspectives, and I wanted to challenge myself to tell this particular story in such a way that you needed all three characters' perspectives to piece together the full picture. Beyond that, I'm not sure I had any sort of method, though there were things about each character that were vivid to me. I'd make a conscious effort to call them to mind before beginning to draft or (especially) revise any given scene. With Violet, for example, it was all too easy as a mother, myself, to imagine her emotional turmoil. And with Caitlin, I had a sort of metaphor, oddly—I'd picture the expensive designer purse she mentions early on, the one her pedigreed husband gifted to her but that she then inadvertently filled with the messy stuff of motherhood: dried-up loose wipes and goldfish cracker crumbs. That was how I pictured her. I think each of us needs to find our own way to channel a voice, whether a novel contains one or three of them. HRP: You often speak about your misguided first attempt at a novel, which you ultimately shelved before you wrote Almost Missed You. How would a writer know when to just “let it go”? JS: Well, I wouldn't necessarily call my first attempt misguided; my earliest novel did land an agent on a revise-and-resubmit request, which taught me an enormous amount about applying feedback to my work. It did not find a home with a publisher and, in retrospect, I think, perhaps, my agent at the time was not the best fit for me. But I speak about it often because it's important for writers who are feeling as if they've hit a wall to hear that there is hope. In my experience, at least, when you spend literally years vacillating between rejections and radio silence on your submissions, it takes a toll, and that's when it's easiest to give up. I didn't truly let go of that first project until I signed with a new agent on a second project and she flat-out told me she did not feel that the first book was as worthy as my second. She had reviewed both projects and told me that my growth as a writer was evident, and it was hard to argue with that. The key, then, was that I had grown and had produced something new during those frustrating years. That is the best course for anyone, I think. HRP: Your next book is due to launch in 2018 from St. Martin's Press. What can you tell us about it and what else can we expect from you? 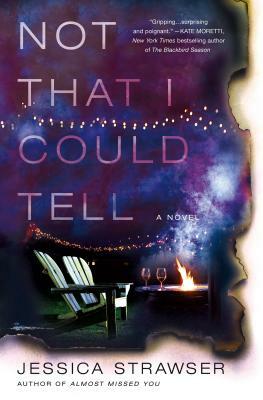 JS: Not That I Could Tell is another book club sort of book: a blend of upmarket women's fiction and suspense, set in an eclectic Ohio small town and dealing with the question of how much responsibility we bear for what happens to our friends and neighbors. And, over the summer, I signed a contract for a third novel with St. Martin's. Holly Rizzuto Palker’s essays have appeared in many publications such as Newsday and Brain, Child Magazine and she’s working on a novel. She teaches creative movement and drama to pre-school children while she raises her own three children, a husband, and a dog.